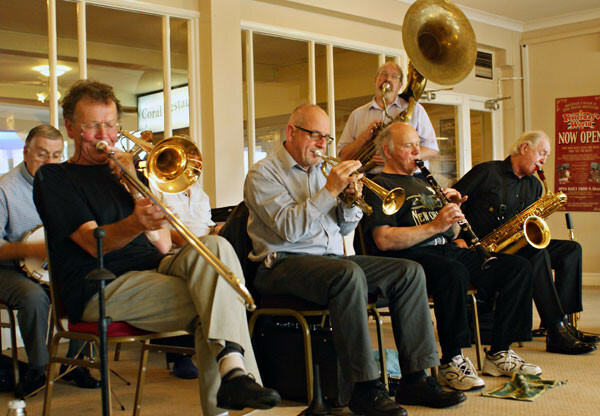 Ray Colyer is a mainstay of the East Kent jazz scene, where we were both involved in helping launch the UK’s latest and successful Jazz Festival, Ramsgate Seaside Shuffle, back in 2011. We have since become close friends and join forces annually at the Hemsby, Norfolk, Autumn Jazz Parade. some mean solos during the sessions. “Take it away, Ray” Portrait by Peter M Butler commissioned by Ray Colyer. 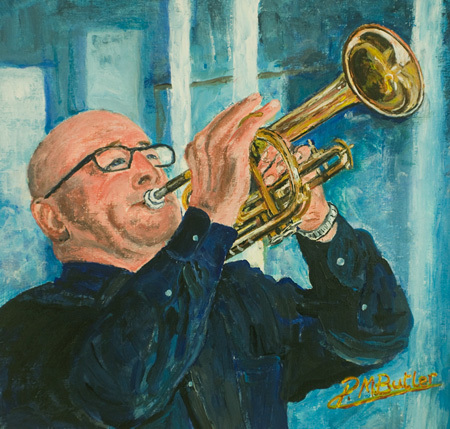 Ray asked me if I could paint a jazz portrait of him on trumpet. I was delighted to accept the commission and chose to portray him playing at the Hemsby jam sessions. So above is my portrait of Ray taking it away. It is essential that I do more, as a matter of urgency, to cover the growing costs (travel, charges, fees etc etc) of featuring jazz bands, musicians, clubs and festivals on Jazz&Jazz and of the publicity and support I hope it offers to the cause of jazz. So it goes without saying that I’m always prepared to consider commissions as well as selling original portraits and fine art Giclée prints which I produce myself. I would much rather this than request donations towards the cause. But I really must express my appreciation for a number of clubs who are contributing annually to the costs in appreciation of Jazz&Jazz featuring their events.